In a new promo, Ellen DeGeneres would like to thank the Academy for letting her host a second time, but will the orchestra let her talk? 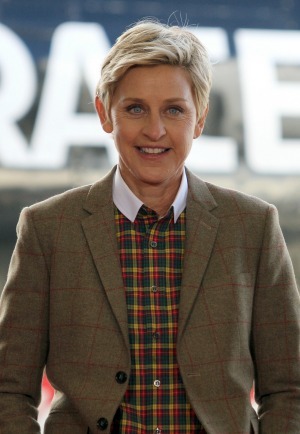 The 86th Annual Academy Awards are only 33 days away and host Ellen DeGeneres is gearing up for the big show. In a new promo released on Monday, the TV personality thanks the Academy for the opportunity to come back as the host for a second time. The 15-second clip mimics what happens onstage on Oscar night: the orchestra plays the winner off if they talk too long. However, the music quickly grows louder and she says, “OK, wrap this up,” while motioning with her hand. While DeGeneres didn’t get much time in the video, hopefully she will have plenty of time to show off her hilarious personality on March 2. The Oscars also released some exciting news for The Wizard of Oz fans on Tuesday. Show producers Craig Zadan and Neil Meron announced that the show will honor the 75th anniversary of the classic film. There’s no word on what the producers intend to do during the tribute or how it will fit in with the previously announced theme of the show, movie heroes. Either way, it should be a great night of entertainment, but we still have to wait a whole month. Watch Ellen DeGeneres in her new Oscars promo.